The US House of Representatives has voted to award Burmese pro-democracy leader Aung San Suu Kyi its highest honour - the Congressional Gold Medal. Supporters of the bill, which passed 400-0, said the move was meant to send a message to Burma's military leaders. "We will continue to pressure the junta to release her and bring freedom... to the people of Burma," said Joseph Crowley, a Democrat. 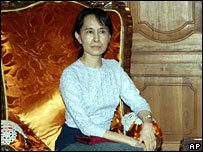 Ms Suu Kyi has been kept under house arrest for 12 of the past 18 years. Her National League for Democracy (NLD) won polls in 1990 but was never allowed to take power. "For three decades, Aung San Suu Kyi has valiantly led the non-violent movement in Burma for democracy and human rights," Mr Crowley said after the vote on Monday. "Her work and dedication to the cause of freedom and individual liberty has earned her recognition throughout the world, including the Nobel Peace Prize. "Today, the US House of Representatives showed her and the world that she has also won the hearts and minds of the US Congress." The bill will now be referred to the US Senate, which must also back the measure. More than 300 individuals and groups have received the Congressional Gold Medal. George Washington was awarded the first medal, which originally was given to military heroes but was later expanded to include prominent humanitarians, scientists, explorers, artists and others. Non-American recipients of the medal include Winston Churchill, Pope John Paul II, Nelson Mandela, the Dalai Lama and Mother Theresa.